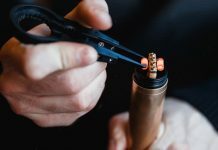 Home Advanced Users Coil Building Product Showdown: Cotton Bacon – Which Version Is Best? 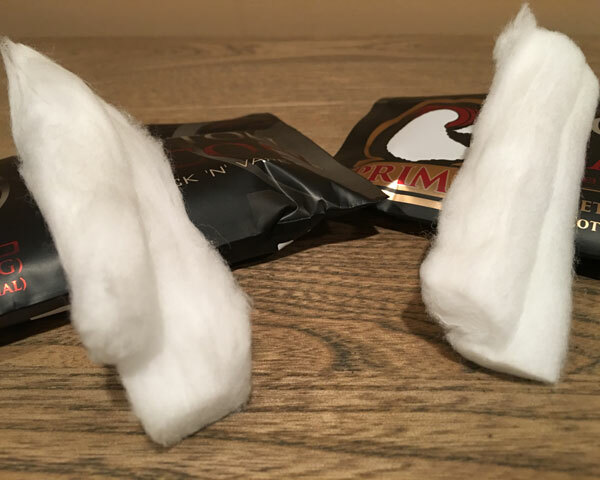 We put Cotton Bacon's wicking materials to the test! 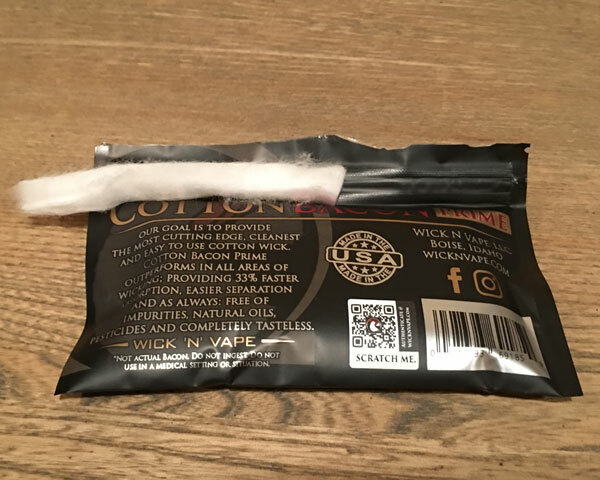 Cotton Bacon is a favorite among many vapers, and rightly so. It’s a good quality product for a reasonable price. 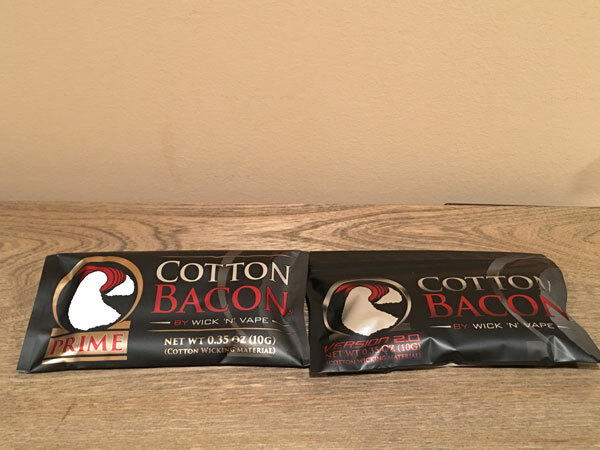 But which Cotton Bacon is best? Today we aim to find out! Prime and V2 look almost identical, everything from the black packaging to the lettering. If you weren’t paying close attention, you could easily mistake one version for the other. 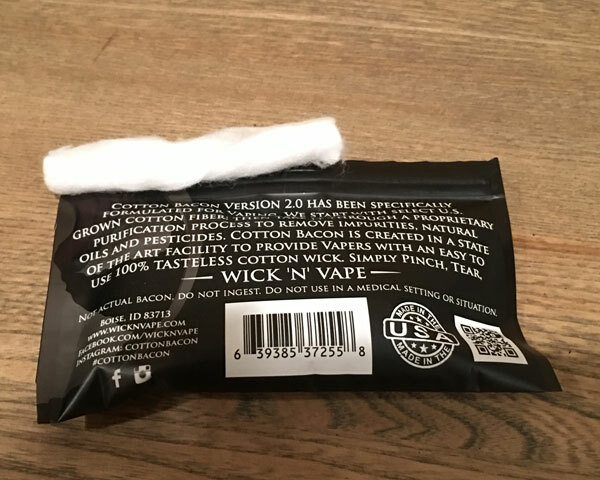 From what I observed, you essentially receive the same amount of cotton with both versions. There may be a slight difference in weight (I did not have a scale), but both are marked .35oz on the outside, so we’ll have to take their word for it here. 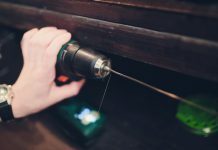 It’s only after working with each piece that you’ll take note of the difference, and even then, there not easy to point out. V2 was a big improvement upon first version of cotton bacon. Although I was unable to get an old bag, I can distinctly remember the low density, stringy, fluffy V1. 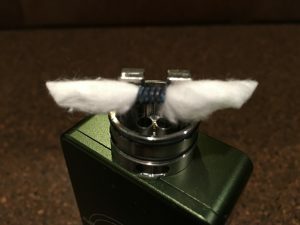 This version, on the other hand, is a workhorse for wicking and re-wicking. The flavor is great, and the absorption properties are right on par with the good stuff. Prime seems strikingly similar to V2 when comparing them side-by-side on a table. And it’s miles better than the first version as well. 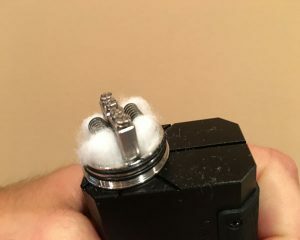 It’s only when you grab a piece and start playing with it (code for re-wicking my RDA…) that you realize the minute differences. The flavor was right on par with V2, and the absorption properties were rather similar as well. There were only a few differences I found when comparing them together. 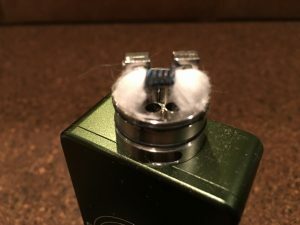 I did perform a small absorption test with both cotton versions, and found the prime to wick more efficiently and hold slightly more e-juice. Visually, both cottons are very similar — it’s only when you observe them under a good light that you notice the Prime has undergone a more extensive washing phase than the V2. The different washing method produces more of a true white blended cotton. There were two things I observed when wicking with each version, though. Prime had a noticeably lighter tensile strength, whereas V2 was a bit more compact and slightly tougher to rip apart. 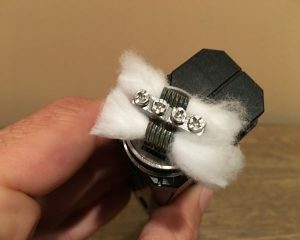 This made wicking with Prime slightly easier overall. As for the absorption properties, I did take note of the Cotton Bacon Prime holding a bit more e-juice for a ‘slightly’ longer period of time. As for how long each version lasts when compared in a similar environment using the same power/temperature etc. I would have to side with the V2; its toughness (could be correlated to the decreased washing time…) seems to give it the upper hand in the longevity test. 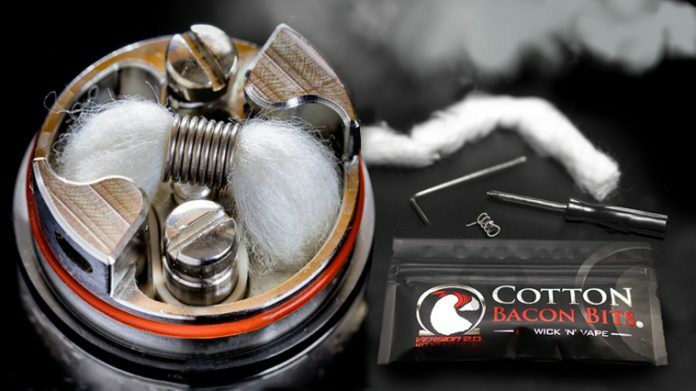 If you’re looking for a good wicking material, you really can’t beat Cotton Bacon. As for which version to choose, I think you’d be safe with either one. Prime will look better on your deck and wick slightly more e-juice (this may be good for tanks actually…). V2 may not have the same level of Instagram worthiness for photos, but will last you a bit longer overall. For the most part, the two versions are basically the same thing. You’ll be good to with either one.